Electrifying Harrogate’s train line should be a top priority, Transport Secretary Patrick McLoughlin was told today. A cross party task force lead by Harrogate and Knaresborough MP Andrew Jones, named 12 top priority routes in the north of England which should be electrified to grow the regions economy. The York-Harrogate-Leeds line is one of six rail routes in Yorkshire which the taskforce recommends should be part of the next investment plan by Network Rail which will cover the five years from 2019. Electrifying the line would bring a £400million boost the areas economy, a business case report has found, and will double the number of trains on the crowded route. 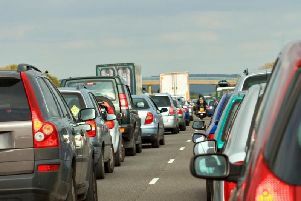 Journey times would be cut by 15 minutes and an estimated half a million few car journeys would be taken each year. Mr Jones said: “The need for rail electrification is significant. It is part of the improvements in infrastructure that we need in the north. “We know how much there is to do and to do it we are looking at a task of generational scale. Indeed, this report is intended to look years ahead. Electrifying the York-Harrogate Leeds line will cost an estimated £93million.